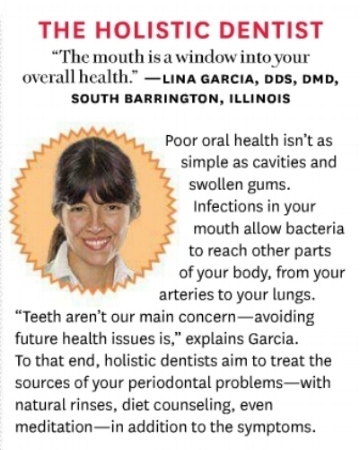 Dr. Lina Garcia’s Holistic Dentistry focuses on whole body wellness that starts with the mouth. Dr. Garcia is committed to providing outstanding care by educating patients on oral health and its effects on the entire body. Our patients are well informed about the current state of their health and the steps they need to experience whole body healing. Patients will gain knowledge in oral hygiene, nutrition, and osteopathy which all play an important part in the healing process. Dr. Garcia and her experienced team will ensure your visit is pleasant and comfortable. 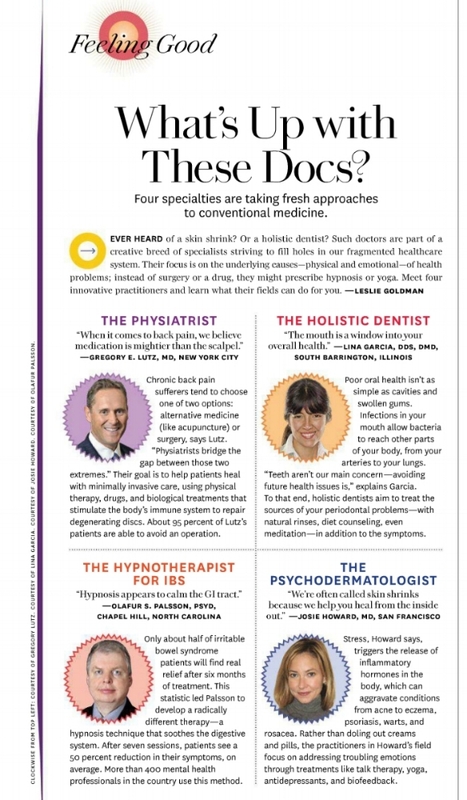 The article, titled “What’s Up with These Docs?”, talks about four innovative health practitioners who are taking a new approach to conventional medicine. Holistic dentists are also known as biological or environmental dentists, and they operate according to the belief system that your teeth are an integral part of your body and hence your overall health. Holistic dentists recognize that your oral health can have a major influence on other disease processes in your body. The primary aim of holistic dentistry is to resolve your dental problems while working in harmony with the rest of your body. As a patient of Dr Garcia for more than 10 years, I know she uses the most advanced technology to provide safe and high-quality dental care. Dr. Lina Garcia and Dr. Joseph Mercola explain the connection between dentistry and total-body health. They discuss the dangers of conventional dental practices such as fluoride, root canals, mercury-amalgam ("silver") fillings, and dental metals. Plus, they describe healthier, more bio-compatible alternatives such as all-ceramic dental restorations and replacements. To help her patients understand how dental care is related to overall health, Dr. Garcia wrote the book Cleaner Teeth, Longer Life What Mainstream Medicine Doesn’t Know or Won’t Tell You that encourages everyone to learn more about nutrition and to understand the dangers of fluoride, mercury-amalgam fillings and root-canal procedures which are still prevalent in conventional dental practice in the United States. Dr. Garcia's book is available now by clicking on the book image below.